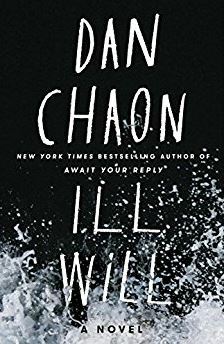 My Snotty Literati Column’s latest review is Ill Will. Check it out now! Months away from each inheriting a massive sum of money—life-changing money—Jack, Melody, and Bea Plumb learn the cash they have been counting on is gone. 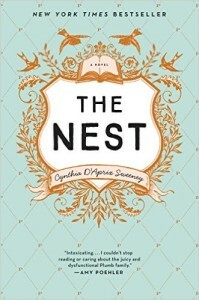 The Nest has been drained to cover up eldest, favorite, and married son Leo’s indiscretion involving a 19-year old waitress, a car accident, and rehab. This executive decision by Mama Plumb results in the already dysfunctional family kicking it into high gear. Sweeney writes with a good balance cleverness and snark while weaving in some tenderness as the Plumb siblings’ secrets and fears unravel across the pages of this engaging debut. Jack has secretly borrowed against the vacation home he shares with his husband to keep his antiques business afloat. Melody and her husband are upside down on their mortgage and have twin daughters just a year from college, and baby sister Bea is a published author that had to return the publishing advance on her second novel when she couldn’t produce. In a nutshell, they all needed The Nest and are after Leo to get it back. The Plumbs aren’t perfect. In fact, most of them are a bit self absorbed in the way that we all are. But Sweeney has crafted a family of imperfect people, who act in selfish, dysfunctional, unimaginable, sweet, and, ultimately human ways. If you need an escape, The Nest, is a great distraction. This slim novel was Kindle-gifted to me by my stepmom at the end of our fall break in Boston and New York City this year. The book is narrated by an unnamed woman, who is celebrating her birthday with her best friend Gay, Gay’s husband Len, and the narrator’s former lover, Wes. Gay and the narrator met in college in the 1930s and have maintained a 3o-year friendship despite their dramatic differences. Now, it’s 1960s Boston, and there’s lots of talk of martini lunches, affairs of the heart, betrayals of friendship, books and feminism. Gay is straight and narrow, the narrator is not. They are the yin to each other’s yang, and despite the narrator’s unreliability, I really liked her. She’s full zingers and quotes that could appear on the next Anne Taintor notepad. She struck me as the person you would sit next to at a party if you didn’t have anything nice to say about anyone—she would love to talk with you. I could go on… but what kind of review just reprints the whole book? The book is not perfect, by any means. But it’s a gem. Our lushy narrator can ramble at times; however, the she propels the story forward nicely, throwing in her share of secrets and some of Gay’s as well. 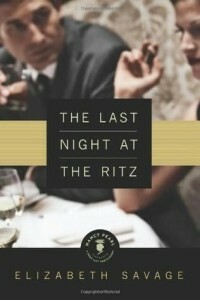 The Last Night at the Ritz does a swell job unfolding a story of a complicated life-long friendship in one night’s time, across a number colorful stories and cocktails. I actually picked up Thirteen Reasons Why after downloading the much talked about Tragedy Papers by Elizabeth Laban. In fact, the book’s description said, “… perfect for fans of Thirteen Reasons Why and Looking for Alaska”. And since I didn’t have either of those books, you can imagine what I did. It’s timely. There’s a horrifying trend these days with children getting bullied and made left to feel undervalued, unimportant and unnecessary. Hannah Baker has just recently taken her own life for these same reasons. 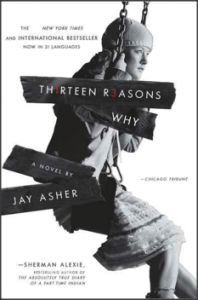 In Thirteen Reasons Why, we hear her side of the story over the course of seven cassette tapes she recorded before her death and mailed out Clay Jensen, one of the “reasons”. It’s bold. Asher doesn’t minimize Hannah’s experiences. Her perceptions and recollections are raw and realistic and written in the voice of a teenage girl who’s hurting. It’s creatively told. Clay doesn’t understand what role Hannah thinks he played in her death and he balances a voyeuristic desire of listening to each tape with the fear that he could actually somehow be responsible. The double narrative makes this story work. It’s heartbreaking. From the beginning you know that Hannah is dead and that she attributes her suicide to the cruel and unfair treatment she received from others. Treatment that has resulted in a widespread, but not entirely true reputation of Hannah. Despite this, Hannah understands how some of her choices facilitate her unsavory rep and at other times she seems completely unaware that what she is doing will further this bad perception of her. It’s frustrating. Just as teenagers can be, Hannah’s victim role is frustrating. You want to say, “Snap out of it!” “Quit perpetuating things!” “You can create a different outcome!” But she’s 16 and hurting and shortsighted. So realistically and painfully shortsighted. It’s hopeful. Not everyone in Thirteen Reasons Why is a terrible person. There are moments of kindness and even grace. Clay grows through the experience of hearing Hannah’s story, as devastating as it is to hear. It’s important. I think teenagers should read this. And parents. And educators. It’s not the definitive story on bullying or suicide but it certainly sheds light. It’s also a bit dramatic at times, but I think high school is more dramatic today than when I was there. In truth, it’s hard to read. It’s depressing. It’s uncomfortable. But, readers will recognize the characters in the book as people from their own adolescence. And everyone can benefit from the reminder of how important how we treat each other is … that kindness must trump everything else. Always. I can’t stop hearing about Gone Girl. It’s everywhere. Every best book list for last year. Every bookstore has tables and tables of it. Every airport has it. Everywhere! People are telling me I HAVE TO READ IT. I mean, I see or hear about it as much as I hear that Call Me Maybe song. Confession time: Hey, I just met you and this is crazy… but I love that Call Me Maybe song. Seriously… way too much. It’s on my iPod. I listen to it every time I workout. I listen to it when I don’t work out. It’s a total guilty pleasure just the way good pop songs are supposed to be. Despite all this, I am kinda convinced all the air time, over-exposure and gazillion parody videos that came from Call Me Maybe will probably resign Carly Rae Jepsen to one-hit wonder status, because how can she ever do anything bigger than that? It might be impossible. And if you are wondering what on earth this has to do with Gone Girl, I am getting there. I first read Gillian Flynn when the Book Babes selected Sharp Objects for book club a few years back. We all read it, were super creeped out and loved it. Ms. Flynn was already starting to get quite a following with this book and her next one Dark Objects. But not a Carly Rae Jepsen-level following. You want to be good but not YouTube crazy parody good, which I am not quite sure how you even do with a book… but I think you catch my drift. Fast-forward several years and everyone has read this Gone Girl book and is stark-crazy raving about it and Gillian Flynn is the new “Mistress of Mystery”. (I am making up that moniker, but someone has probably penned that nickname and if not, okay, I’ll take credit for it). And thank goodness this is her third book so she really can be the Mistress of Mystery and not the “Carly Rae Jepsen of Mystery”. Now if that Jepsen girl has another bona-fide hit, my iPod and I will be thrilled, but my analogy here will be screwed. And what’s that analogy again? Be popular, but not Carly Rae popular. Nick and Amy Dunn have been married for five years when the recession forces them out of their cushy writing jobs in Manhattan and back to Nick’s Missouri river hometown to care for his declining mother. Amy misses the life left behind—one of privilege and minor celebrity status as the namesake of her parent’s wildly successful children’s book series—Amazing Amy! Life in Missouri is hard hit by the recession, houses in the Dunn’s neighborhood are foreclosing and Amy is declining. Nick is trying to make the move back home work. Going in on a bar with his twin sister Margo, he’s the only one with a job. Long hours take time from the marriage. They take away the spark as well. The day of their five-year anniversary, Nick gets a call he never expected. Racing home, he finds an open front door, a ransacked living room, lots of blood and no Amy. Enter the police. Nick can’t stop lying to them, which doesn’t help matters. His disposable cell phone keeps ringing at the most inopportune times and he quickly finds himself in the role of leading suspect. But let me tell you a little secret. Everything I told you is laid out for you in the first 30 pages. 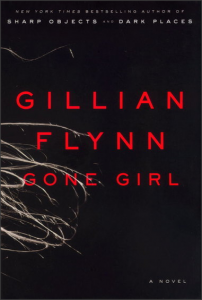 Flynn is known for writing super topsy-turvy, twisty-turny thrillers and Gone Girl taps out at 419 pages. So guess what? All is not as it seems. Told in alternating chapters with Nick narrating his story in the present day and Amy’s story from a few years back, the reader is sent down a pretty twisted (read: crazy) rabbit hole to figure out who killed Amazing Amy. I really can’t tell you anymore, except to read it. Gone Girl is a trip. A road trip into creepy crazy town. Flynn sets the stage well, keeping you guessing as you drive the car slowly up the hill and just as you make it over the top, the car starts careening out of control and you realize there aren’t any brakes. It’s a totally wild ride that ends in utter shock. Some of the Book Babes didn’t buy the ending. Some of us felt it couldn’t have ended any other way. Not one of us could stop turning the pages. Room by Emma Donoghue has been on my list for some time. I almost mandated it for my turn at book club in December, but then remembered I never mandate, always preferring to offer my fellow clubbers with a choice. Thankfully, my BFF is in book club and loves to mandate. And that’s how this debut novel got promoted from the proverbial nightstand and into my hands via my beloved Kindle. So an interesting thing happened when I started reading ROOM. I wasn’t loving it and I wasn’t immediately sure why. It’s narrated by 5 year old Jack, in the innocent, rambling, run-on sentence babbling, precocious ways of many kiddos. Donoghue had nailed the voice of her narrator and it was completely authentic. After a full day of work and a few hours with my own innocent, rambling, run-on sentence babbling, precocious six year old, I sat down to read looking for escape and found myself a bit as trapped as Jack and his Ma, in a tiny little room. Confused? If you don’t know about Room, that’s the deal. Jack and his Ma live in a single room. It’s the only life Jack has ever known. There is no outside, no parks or schools, friends or family. The only other person Jack knows of is Old Nick, the man that comes by from time to time to deliver food and highly anticipated Sunday treats. As Ma passes the time reading Jack the same 5 books, creating opportunities for physical education, math and creative time, I was wondering how she didn’t go completely insane. But I had to forge on. If not for the fact that I had heard so many good things about Room, I had to finish it for book club. I don’t want to spoil anything, so I am not going to cover any other plot points… I will say, however, that I ended up enjoying Room. The second half was the clincher for me (even though I have heard several people say they liked the first half better, go figure). Donoghue has created extremely likable protagonists in Jack and Ma in a confining and harrowing environment. I also like that the outcome was a bit of what I expected and a fair amount of what I didn’t. Donoghue’s storytelling is compelling, engaging and different. She’s definitely someone I will keep an eye on in the future. Right before heading out for vacation it seemed a perfect week to revisit one of my favorite authors; a poet, no less. I love Billy Collins and after reading two of his collections (Ballistics this year and Nine Horses a while back) I was anxious to pick up a third. THE TROUBLE WITH POETRY AND OTHER POEMS was the lucky winner. The title alone cinched this week’s selection for me. I mean, there’s so much trouble with poetry, isn’t there? Or maybe it’s there’s so much trouble with me and poetry. Poetry and I have a long and sordid history. One that involves a lot of not getting along and total misunderstandings. Then Billy came along and he was like the new poetry boyfriend that really “got me”. That all being said, the trouble with THE TROUBLE WITH POETRY is that overall, it’s not my favorite of his collections, yet it has my all-time favorite poem of his in it: The Lanyard. In simple words that evoke real emotions, Collins is able to show the attempt a child makes in saying thank you to his mother for all that she has done (including giving him life) by making her a lanyard at summer camp. It’s funny and poignant and nothing short of wonderful. You, Reader; On Traveling Alone; On Not Finding You at Home; Class Picture, 1954; Fool Me Good and The Trouble with Poetry are my favorites after one reading. While there are a handful of great poems in THE TROUBLE WITH POETRY, there are a number that I didn’t connect with. Despite this, I am not sensing trouble in paradise just yet. I am finding that poetry is often something to be contemplated and considered and may not hit the spot after the first reading and I am okay with that. This reconciliation poetry and I have going on is still very much in the beginning stages. It’s definitely too soon to throw in the towel. I think we are both willing to spend some time on it and see where it all goes. I might even start reading other poetry because of it. Fall is the craziest time for me at work. It’s my busy season if I were an accountant. My three months of Black Fridays if I were in retail. And it’s a time that I don’t need anything extra going on, but there always is something a little extra. This time it’s an upcoming week off in Boston (timed for the change in season, not my workload) and, of course, this project. So I reached this week for a book I have had for years: A VIRTUOUS WOMAN by Kaye Gibbons. I fell immediately into this slender love story, told in alternating chapters by Jack Stokes and Ruby Pitt Woodrow, seemingly mismatched lovers with about 20 years separating them. Jack was nothing to look at, but knew the moment he set his eyes on Ruby that she was a girl he could marry. Ruby, having just come out of an abusive marriage was looking for someone safe and kind. It was this connection, a desire to love and be loved, that seemed to work for them. At the start of the book, we learn that Ruby has succumbed to a difficult and much to early battle with cancer. Jack is stumbling through this loss and it is through his memories and her narrative prior to her death that we learn what a rich love they had, despite or in spite of their circumstances. A VIRTUOUS WOMAN is a lovely story told with a southern lilt that I always enjoy reading. It’s not a book that will change your world, but one that can take you away from it, if only for a few hours, and expose you to an uncommon but richly told story of enduring love. So a funny thing happened on my way back to the office after lunch on October 1, 2009 (and no, I don’t have a freaky good memory, just mad web searching skillz)… I was listening to NPR and came into the middle of some interview with some guy that had written a book and I think greeting cards were somehow involved. And you know how that is when you are coming into a talk radio program trying to catch up and figure out what is going on. Well, I was doing that and navigating the traffic and then all of a sudden I hear Neal Conan welcoming some caller named Tracy to the show and within the first syllable of this Tracy person opening her mouth I realize it’s TracEY and she’s a dear friend of mine from college who I had not seen in about six years. And here she is calling in to say she knows the author, Dave Dickerson and they went to college together and she was so excited to hear of his book and success and just wanted to say hello. And I know there were just too many ands in that paragraph but it really was all that. AND… how cool and weird that we were all, in some way or some relay, all catching up with some part of each other through Neal’s show. Now, I don’t know Dave, but he sounded very affable and smart and I made a note to look up his book. Now, I am never one to pass up a book–a free one at that. And, with it being one that was already on my list to get, well picture me pleased while I picture you all wondering if I am ever going to get to my review of it. And, I will. In just a minute. I promise. So, while I was super excited to get this book, I was also kind of nervous. Tracey knows about this crazy reading project I am doing and she knows I write up reviews of all the books I read. Big deal, right? Well, I haven’t been in a situation where I am friends with someone who is also friends with the writer of one of the books I am actually reviewing. Tracey is cool beyond cool and would want me to be totally honest, which is great. But truth be told, there was a little bit of pressure. Just a tad. Well thank goodness Tracey knows me as well as she does (college friendship plus 20 years and a facebook reconnection will do that for you). I really adored HOUSE OF CARDS. The first thing it has going for it is that it’s a memoir. You all have pretty much figured out that I love me some memoir. Secondly, it’s so very well written. Very well. Dickerson is wicked smart (like so smart he creates those crazy puzzles that are published in puzzle magazines for other smarty smartenheimers that I can only imagine exist). He’s also a master with the rhyme and friends with Will Shortz. Yet despite all this and his mighty brains, Dickerson brings the same conversational tone that I overheard while he bantered with Neal and Tracey on NPR back in October. 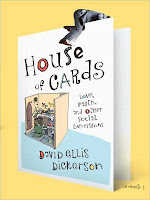 This made reading HOUSE OF CARDS like sitting and having a conversation with an energetic and engaging friend. Third, it’s really interesting. In addition to getting a glimpse of life at Hallmark (which you would expect to be as warm and fuzzy as the cards they sell, but SPOILER ALERT: It’s not! ), you get a peek into the life of a lapsed fundamentalist Christian virgin who at 29 is trying to connect with others and make a name for himself doing what he does best: write. Hallmark plays a major role in the book. In fact, it’s almost another character. Dickerson describes, with much heart, the challenges and pain we all can feel when we are trying so very hard to fit in, locate like-people, and find our niche in an all-new world. Dickerson had envisioned Hallmark being a perfect landing spot; but, it proved to be one nut that was a pretty tough to crack. The secondary story line that actually ends up proving to be of primary focus, is that of Dickerson’s personal history and his relationships. Dickerson grew up in an extremely conservative religious environment that he began to question as an adult. Despite initially converting to Catholicism and embracing more liberal views of the world (he’s now an Atheist), he found it hard to break from preconceived notions and beliefs that had guided him for so long. In his time at Hallmark, the rose colored glasses were coming off and it resulted in some hilarious, heartbreaking and cringe-worthy moments that may not be the experiences of the average modern male, but they were his own. I guess you could say that HOUSE OF CARDS is a story that captures a window of time in the life of a man who is finding his way. A bit of a late bloomer who is finding his stride. A man who definitely has found his niche in the wonderful world of words. Oh, and if you want to check out his chat with Neal, CLICK OVER HERE. MENNONITE IN A LITTLE BLACK DRESS: You had me at the cover of your delightful looking little book. Yes, it was your cover that had my interest on high alert and my mouse ready to click “Add to Cart”. Then I looked closer and saw that you were a memoir. And you were endorsed by Elizabeth Gilbert of EAT, PRAY, LOVE fame. Well, I just had to add you to my shelf of all of my other impulsive book purchases that I have made but can’t actually make good on reading until some later date because that’s just how I roll. Fast forward two months and my book club selected it for our August read. Picture me thrilled! Fast forward just a teensy bit more and see me glad to have read it but with a luster that’s faded ever so slightly. MENNONITE IN A LITTLE BLACK DRESS (MENNO) is writer and professor Rhoda Janzen’s memoir of returning to her roots after a devastating car accident that left her physically scarred and the dissolution of her 15-year marriage that emotionally wrecked her. Home for Janzen is her Mennonite community on the west coast, thousands of miles from the midwest and her life of academia. Despite eschewing much about the faith, the food and the conservative upbringing her parents provided, Janzen finds that home is where the healing is. In a dozen or so chapters, Janzen shares her history, both as a Mennonite daughter and then a codependent wife married to a charismatic yet bipolar, emotionally abusive and ultimately bisexual man who leaves her for another man. Her gift is in her sense of humor and ability to embrace a community that she once left behind. Janzen does this with a very conversational tone, a must for me in a good memoir. She seems very real and someone who would be great to sit next to at a dinner party. My only real complaint was the number of stories and anecdotes she shared to give the reader a glimpse of her personal history. She crams so many of them into MENNO that I felt that she often interrupted herself to get another story in. And yet there were moments of realization, of reflection and remembrance captured so very eloquently that her talents as a writer can’t be denied. And, it’s this contradiction that has me struggling. I think MENNO is definitely worth a recommendation, but I wouldn’t say it’s for everyone. Oh, how I wanted to remain as totally smitten with this book as when I first laid eyes upon the cover! But I am a little more informed and a little better off for having read it. And I am sure, just like finding the perfect little black dress, this book will be the perfect fit for that special someone.